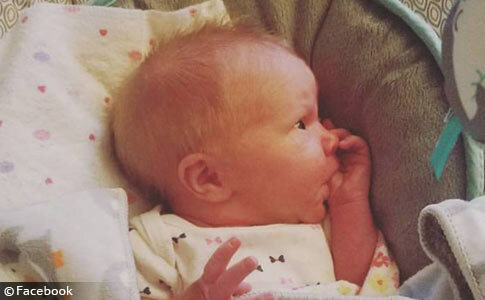 Susannah Jean Murray, 3-weeks old, was killed by a family pit bull in Grand Rapids. UPDATE 07/03/17: Today we visited our P.O. Box and received the opinion from Kent County Prosecutor Chris Becker that we requested on June 19. Reports by the media left out critical details, including that Momma was in the room with the infant, along with Rhino, when the baby was discovered injured. To recap, from the get-go we suspected Momma was involved because the baby's father said the female killed the baby. Momma was the only female dog in the home. The family adopted Momma from the Kent County Animal Shelter several years earlier, the same agency that refused our FOIA about this issue. The two adults said they were only on the porch for five minutes. When Rodriguez went inside to check the baby, she noticed Rhino licking Susannah's face. "Momma was also in the room at this time, but this dog was not next to the baby," Becker wrote. The medical examiner indicated the cause of death was "craniocerebral trauma." Susannah had "multiple laceration, abrasion, contusions, and puncture wounds of the head consistent with dog bites," Becker wrote. It is true there would be no way to irrefutably prove which of the dogs attacked the baby. There were no witnesses for five minutes, leaving four minutes and 55 seconds for the dogs to act. Both dogs may have been involved too, as is often the case in fatal dog attacks. As a reminder to parents, an attack like this, enough to fatally injure a newborn, can happen in mere seconds. Think about that the next time you see a propaganda photo of a pit bull lying with a baby on Facebook. Kent County Prosecutor Chris Becker issued a three page opinion today regarding the pit bull mauling death of an infant. Susannah Murray, 3-weeks old, was severely attacked in the head after being left alone with her family's three pit bulls for about five minutes on May 25. The fatal attack occurred in the 1100 block of Kalamazoo Avenue SE. The baby died after seven hours of surgery on May 26. The baby's mother, Michelle Murray, will not face any criminal charges. On June 19, we sent a fax to the prosecutor's office requesting a copy of the three page opinion. At that time, Becker's office was already closed. Becker states he found no evidence that any of the pit bulls had been violent in the past -- often a necessary requirement to bring charges. The family claimed one of the dogs was a "support dog" for a child -- which is not a "service dog" nor is it covered under the Americans with Disabilities Act. An emotional support animal (ESA) does have rights under the Fair Housing Act and Air Carrier Access Act, but requires a letter from a physician. It's unclear if that obligation was met. At the time of the attack, there were other children in the home, but not in the living room area where the baby had been left in a bouncy seat. The family's three pit bulls were also loose inside the home. Murray and her friend, Bobbi Rodriguez, had stepped out onto the porch for about five minutes for a smoke. When Rodriguez came back inside, she saw one of the pit bulls, named Rhino, licking the baby's face. She kicked the dog away and saw the infant was covered in blood. 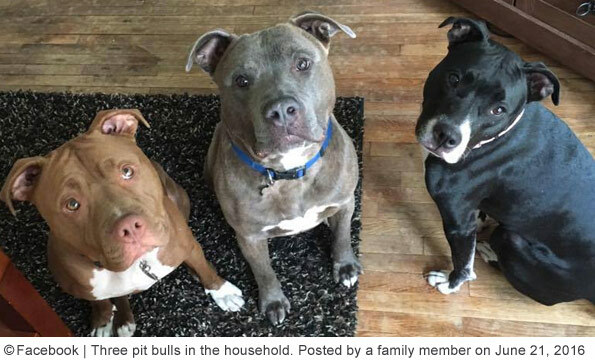 According to the MLive article, the family's three pit bulls are the same ones identified in earlier news reports: Rhino, a 2-year old male, Devlin, a 2 or 3-year old male and Momma, a 3 1/2 year old female. As we stated in late May, Rhino passed the Canine Good Citizen test in February and Momma was adopted to the Murray family by the Kent County Animal Shelter when it was 3-months old. Also, a family member stated in comments that all three dogs were "rescues." 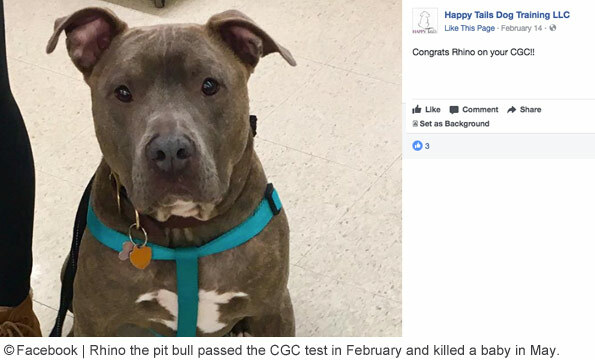 Rhino was likely the killer, which shows that passing the Canine Good Citizen (CGC) test has no bearing on unpredictable aggression, particularly when the owner is not present. The CGC is not an aggression test to begin with (here are the testing requirements). Earlier, the baby's father had stated the killer dog was a female leading us to believe that Momma was the killer. However, Becker said that none of the other dogs could be ruled out; all three were euthanized Monday. According to Becker, Rhino was also the alleged "support dog." With the proper documentation, Rhino could sit next to anyone on an airplane. Rodriguez told police that her 11-month old had been in the home with these dogs before the fatal attack without any incident. In December, Murray posted a photo to her Facebook page of a baby the same age snuggling with Rhino -- Hey, it was great for social media points back then? In fact, Murray can't get enough social media points. 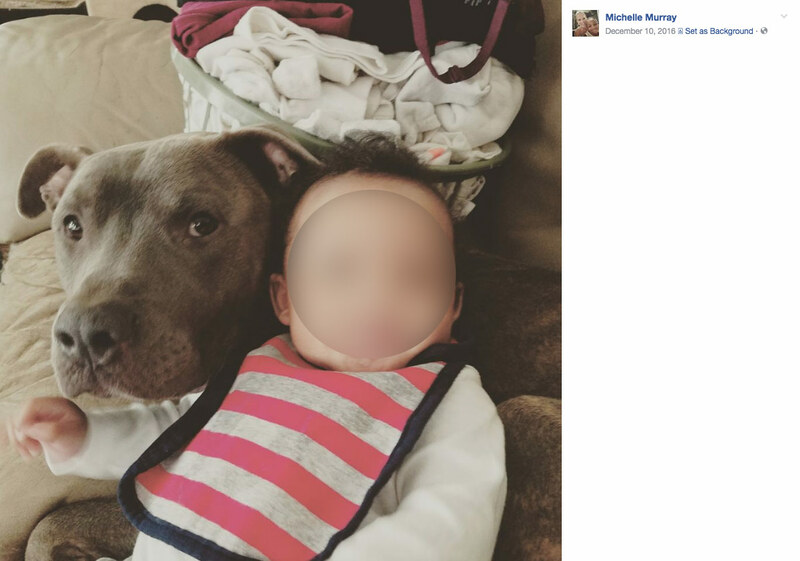 After her pit bull killed her baby, she allowed her daughter to post a photo of the now deceased baby lying with Devlin, the other male family pit bull. Despite unpredictable aggression being a well-documented trait in pit bull terriers, criminal statutes ignore this. "The law imposes culpability in situations where a person knew of a danger and could have prevented something from happening when it must have been apparent injury would result. Neither of these elements are present," Becker states. "Simply having three dogs in the home, even if all of them are a pit bull mix, is not enough to hold a person criminally liable," he states. First, two of these dogs are full breed pit bulls -- enough with the "mix" nonsense. Second, we remind readers that criminal charges require being proven "beyond a reasonable doubt," the highest standard of all. Since criminal charges are about proving a "mindset" (of criminal intent), why can't statutes be written to address people who choose to own a dog breed 1.) Selected for unpredictable aggression and 2.) Kill more people than all dog breeds combined each year? Another child, in this case an infant, is dead due to a family pit bull. This particular dog had passed the CGC test and is an alleged "support dog" for a child, which requires no training or certification and is not afforded the same privileges as a "service dog." Obviously the Murray family is enamored by the breed, they had three adult pit bulls in the home, not just one. 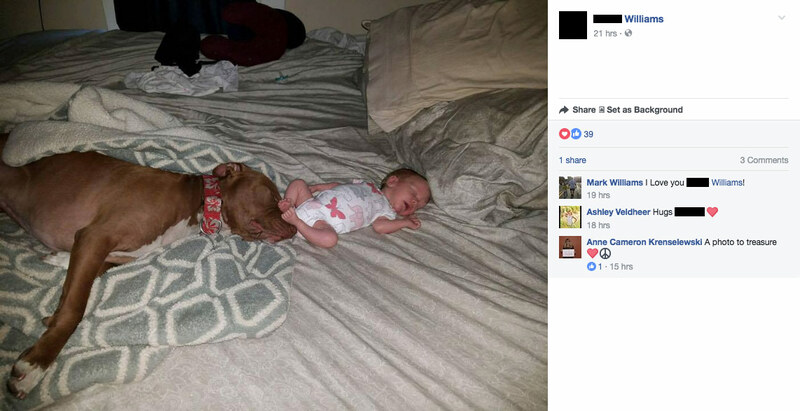 Furthermore, to prove how "safe" their pit bulls are, they posted multiple photos of their pit bulls lying with babies. It will be interesting to see how long it takes this family before they obtain new pit bulls. Don't they have an even greater duty now, albeit narcissistic, to prove how "misunderstood" and "safe" pit bulls are? Don't they have an even greater duty now, albeit narcissistic, to prove, "It's all how you raise 'em?" What family members should do is read Misunderstood Nanny Dogs, by J. Thomas Beasley, to learn about the genetic heritage of a dog breed selected to fight to the death in a pit. The mother of a newborn recently killed by one of her three family pit bulls has been identified as Michelle Murray of Grand Rapids. Murray left her 3-week old infant alone in her home for about five minutes with three pit bulls roaming loose. We already provided a link that "unpacks" the role Murray's teenage daughter played in caring for the dogs. "I pay for their care all by myself," she wrote in 2016. On Sunday, the daughter posted the below image as her Facebook Cover photo. The image depicts the now deceased newborn lying on a bed with one of the family's two male pit bulls. As far as we are concerned, Murray is 100% responsible for her daughter's recent Facebook action. 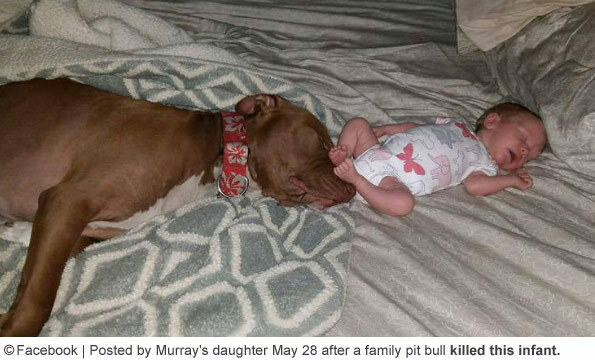 Michelle Murray should be prosecuted for the "vividly clear" preventable mauling death of 3-week old Susannah Jean Murray, which Murray then followed up with sociopathic pit bull advocacy. We hope Child Protection Services takes both children away from Murray -- for good. Meanwhile, Kent County Animal Shelter has five days to reply to our public information request. Late Friday, we posted an image of three pit bulls belonging to the Murray family that was posted to a family member's page on June 21, 2016. 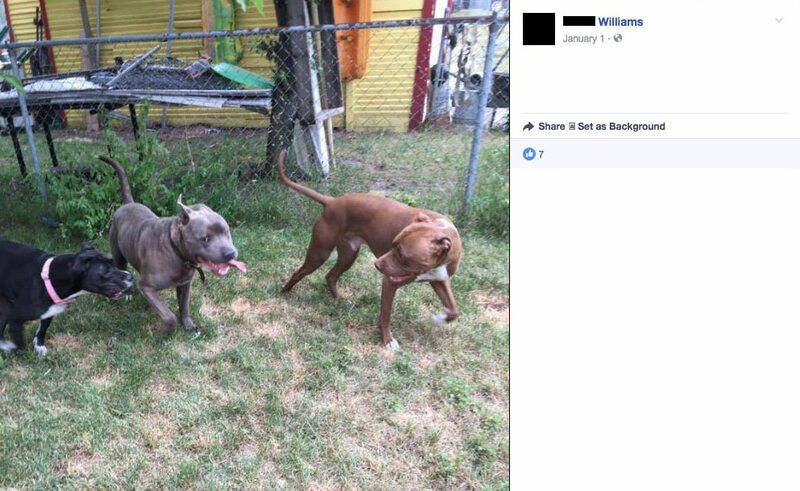 These same three pit bulls were also posted in another photo as recently as January 1, 2017. The black pit bull-mix, a female named Momma, was adopted to the Murray family about four years ago by KCAS. A family member also created a "Momma's Journey" Facebook page last year that details a surgery that pit bull underwent. Finally, as we try to sort through which of the three family pit bulls attacked and killed the infant, a man who claims to be the baby's father said the attacking dog was a female. Thus, we are led back to Momma as the primary suspect, until KCAS answers our public information request or clarity is gained through new media reports.2 We invite readers to watch two videos posted to the Momma's Journey page. The pit bull playing tug-of-war and the three dogs interacting as a pack. Remember, the infant was left alone in the house in a glider (which is similar to a bouncer) for five minutes with three pit bulls roaming loose. Grand Rapids, MI - A 3-week old baby girl is dead after being left alone with three family pit bulls, Grand Rapids police report. The fatal dog attack happened about 6 pm Thursday at a home in the 1100 block of Kalamazoo Avenue SE. After about 5 minutes, an adult checked on the infant and found her bloody with severe head injuries. One of the pit bulls had blood on its mouth, detectives said. The baby was transported to Helen DeVos Children’s Hospital where it died Friday morning. Grand Rapids police Sgt. Terry Dixon said during a press conference the baby girl underwent seven hours of surgery before dying. No one heard crying or sounds of an attack. Child Protection Services was contacted because another child lives in the home, he said. Once the investigation is complete, police will meet with Kent County prosecutors to determine if any criminal charges will be brought. 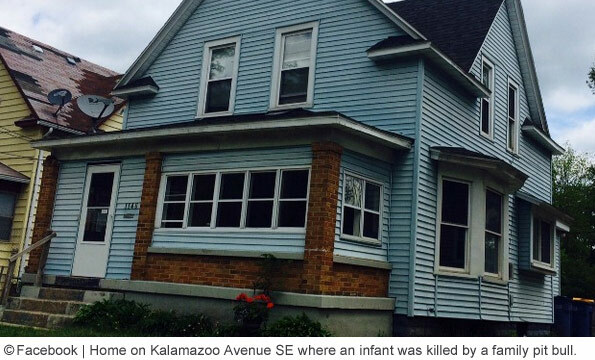 The pit bull suspected in the baby's death is about 2-years old, reports Mlive.com. Dixon also said during the press conference, "Any dog can bite." That is not the issue to discuss after a mauling death or an attack resulting in catastrophic injuries. Both horrific scenarios are largely inflicted by a very small group of dog breeds. Pit bulls make up about 6% of the total U.S. dog population, yet are responsible for 65% (254) of all dog bite deaths (392) from 2005 to 2016. The second leading killer, rottweilers, trails significantly, responsible for only 11%, (43). Reviewing our 12-year dog bite fatality data set -- January 1, 2005 to December 31, 2016 -- we see the U.S. infant fatality rate for ages under 12-months old. During this period, canines killed 392 Americans. 12% (47) were infants under the age of 12-months. Of this subset, 45% (21) were neonates ages 3-weeks old and younger. Of all 47 deaths, pit bulls were responsible for 51% (24). Huskies were the number two killer, inflicting 7 deaths, followed by rottweilers, inflicting 6 deaths. During this same 12-year period five infants were mauled to death by dogs in Michigan, the majority killed by family pit bulls. Holden Garrison of Davisburg, was killed by "catahoula leopard" dog while being held by his uncle in 2014. Tarilyn Luciana Bowles of Detroit, Darius Tillman of Kalamazoo and Leonard Lovejoy Jr. of Eastpointe, were all killed by family pit bulls from 2009 to 2012. Lastly, Kylie Cox of Warren was killed by a rottweiler while siting in a car seat in 2007. The family pit bulls from left: Devlin (male), Rhino (male) and Momma (female). 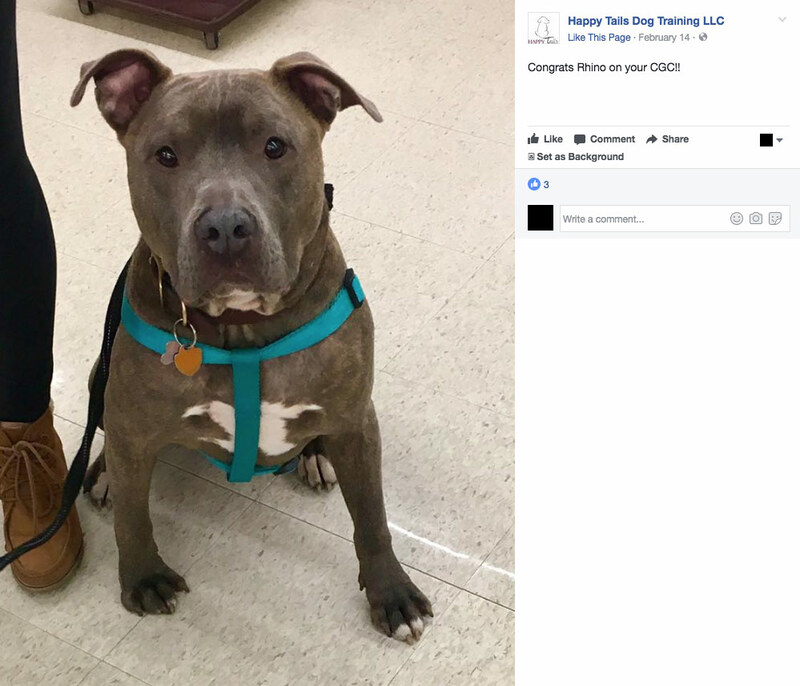 Rhino passed the Canine Good Citizen test in mid February this year, according to Happy Tails Dog Training LLC. 1There is significant history with the Kent County Animal Shelter. Back in 2014, artist Joan Marie Kowal created an entry for the Grand Rapids ArtPrize 2014 competition titled, "Out of the Blue." It was the nation's first physical memorial for victims of fatal dog attacks. Nearly 30 differently decorated crosses represented a person killed by a dog. Kent County Animal Control Officer, Rachel Jensen, participated in an effort to sabotage the memorial by intimidating art viewers by partially blocking them from the memorial with their bodies and their pit bulls. Kent County defended Jensen's actions as well. In this light, it makes sense that police spokesman Sgt. 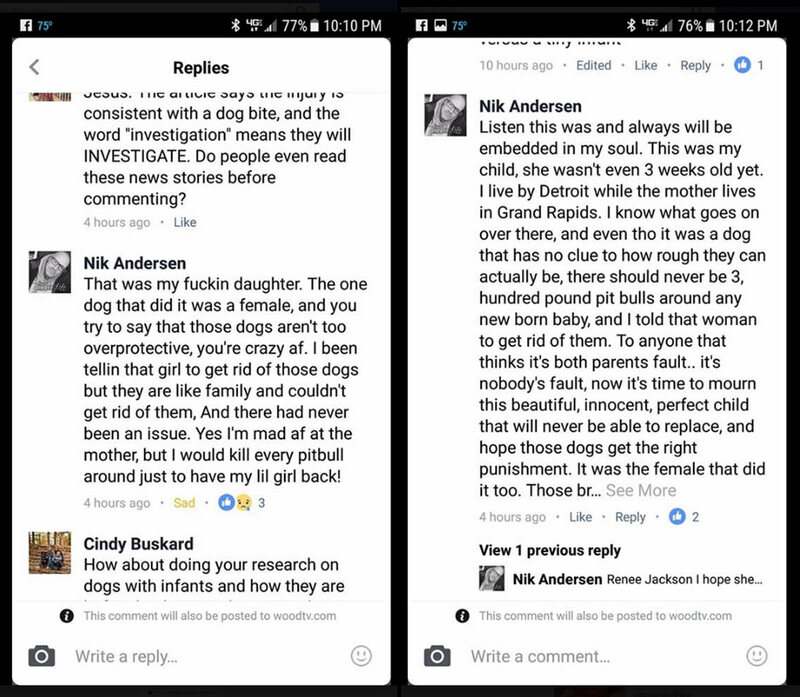 Terry Dixon dished out the "any dog can bite" propaganda routine to the public after a baby was killed by the family pit bull. Also, at that time, attorney Kenneth Phillips, left a related comment, stating: "In law, there is a saying: 'the appearance of justice is as important as justice itself.' (Offutt v. United States (1954) 348 U.S. 11, 14 (U.S. Supreme Court).) This officer has damaged the appearance of justice by showing his or her bias. The results will damage Kent County in the future: the officer’s word will not be trusted in court and other legal proceedings, and significant numbers of residents will feel less safe as long as he or she remains on the job. Kent County: Fire this officer!" 2As if this cannot get more confusing, there is another female pit bull named Bella -- the red and white dog in the Cover photo for the Journey page. This dog is "around" but it's unclear who owns it or where it lives full time. It is not appropriate for police departments to be propagandizing for fighting dog breeders and lobbying groups with this "all dogs bite" deceit, and people need to get really adamant about stopping this kind of outside pressure influencing these public safety departments. This "all dogs bite" is what is leading to grave danger when handling the fighting breeds. No, fighting breeds are different from all other breeds, and they've been bred to be different for hundreds of years. This fallacy about leaving dogs alone with children excuse for these attacks is a foolish and false one too. If kids couldn't be left alone with dogs in general, then there would be millions of dead children per year. THERE AREN'T. But there are plenty of dead and maimed children where pit bulls are, even when adults are present. And why are these dogs being kept alive at taxpayer expense? Why do they always 'quarantine' the killers? If a person had murdered a child, they'd be locked up in jail and people would be advocating for their death. A dog kills and people want them to be free and safe from harm. The world so backwards and it makes me sick. Euthanize those beasts! Did anybody catch the "Good Dog"column and Garden & Gun this month? It's a pro pitbull propaganda puff piece. It's fun how the author writes about three prior dogs from his childhood that affected his fear of dogs. The first to be discussed is a dashhound. Wouldn't you know it, he was terrified of her – and that was constantly biting at him. I have heard the pitbull people claim that the dashhound bites more people than any other dog. Next he discusses two great danes his family had and one of them viciously killed a neighbor's beagle. Finally he gets to the part about the pitbull mix he and his girlfriend adopted which she describes as, " The pit bulls were usually the sweetest creatures." He also claims people have a stereotype against these dogs. Anyway you can Google the article and read it for yourself. The reason for the quarantine? Well, my dear, they're dogs. And everyone knows that dogs are always wonderful! All the time! Even when they kill people! This is where out-of-town dog worship takes​ us. It's outrageous for the police to spread pit bull propaganda WHILE they're announcing the death of yet another baby killed by a pit bull. How did you find their names and FB page? Looks like the police haven't released info that yet. I'd like to see their FB page too. I meant to call it out-of-control dog worship. Hello, everyone! I happened upon this website in my quest to find more information about this horrible disaster. I am a resident of Grand Rapids, so this hits pretty close to home. It's refreshing to know that there are people that defend the regard for human life over animal life. It's causing quite a stir over the dog(s) involved being punished for the adults negligence, but refusing to acknowledge that at the end of the day, the animal is still an unpredictable animal, no matter how well a person thinks they know their pet. I agree that this "any dog can bite" propaganda is causing people to choose want over necessity. My peers really didn't like that I suggested not being able to own animals as pets, aside from research, preservation/observation, and servitude. They ask why punish the majority for the behavior of a few? Well, I question the well being of the greater good, if we can't trust everyone to be a responsible pet owner, how do we keep our communities safe? When there are people advocating for the rehabilitation of dangerous animals- yeah, I'll pass on that. I don't hold the adults any less accountable… but I just find myself asking, "What gives?" Anyway, thanks for hearing me out. I felt like the last woman standing on the topic with my kind of opinion. I care about our kids and members of our community and strive to be part of the change for bettering mankind. The whole thing is eating me up inside. I have a 9yo son who has never recovered completely, emotionally, from a dog attack, by our own dog, when he was three. He tripped over the dog and I know the dog acted on instinct. It just wasn't worth the risk of having pets while raising small children.I felt I did the right thing by putting the pooch down, so it wouldn't happen again. These extreme dog lovers compare animals as our equals and they are not, claiming people are just as unpredictable, but people can choose to do right or wrong. An animal just behaves instinctively. If we want to advance beyond our carnal nature, we should stop putting ourselves on the same level as lesser species. I don't know about you all, but I certainly don't groom myself with my tongue, or squat on all fours to relieve myself, so I refuse to belittle myself by saying I wasn't born more consciously evolved than our animal companions. Then I have an over-inflated sense of self-worth. Lol. Am I the crazy one?? According to at least one pit bull dog ownership manual, tug should never be played with pit bulls. This Memorial Day weekend I attended a presentation of "Dock Dogs," which dogs compete to retrieve toys tossed in a large pool. The vast majority of participants are retrievers and other gun dogs, naturally, with a few herding breeds here and there. The announcer was a typical frat bro type. He yelled into the mic, "We don't discriminate here at Dock Dogs! We love every dog regardless of breed, size, or color! You'll see pit bulls, Rottweilers. It's all about the OWNER! Remember, there are NO BAD DOGS!" Notably, there were no pits or Rotts competing…yet the guy screamed this mini-lecture to the audience nearly word-for-word in the space of about 30 minutes. There were lots of young parents the audience with babies and little kids. This is what they are hearing, nonstop, from the supposed dog "experts." This is why it keeps happening. Whoops…I meant to say the announcer made this lecture nearly word-for-word TWICE in about 30 minutes. When these so-called experts start getting sued, watch them change their tune. Kent County animal control, I am looking right at you. And I will bet that the local personal injury lawyers are too. More white trash putting pit bulls ahead of their own child. These people should go to jail! Ignorance is not an excuse, the information on how dangerous this breed is, especially to children, is out there to anyone who takes three minutes online to look for it. I hope the dogs are all put down, if not the other child should be removed from the home. YQN: I agree, pit bull worship is simply the most extreme form of the dog worship that is permeating western cultures to the detriment of our children, neighborhoods, social interations and the culture itself. SW: I agree. I truly believe at least 2/3 of the people who have dogs should NOT. In my own neighborhood almost every house has one or more dogs, few bother to walk and exercise their dog at ALL, and no one I have seen does more than a very slow, short walk. Few follow the leash LAW, nothing is done until AFTER someone is hurt. NONE shut their dogs up when they are outside going off. The answer to the ever increasing GLUT of dogs is we need to make spay and neuter mandatory for all pet dogs and cats. Anyone who wants to breed should have to get a license, and no breeding of anything already glutting shelters, or dogs with poor health or temperament. I am an owner of three dogs. I rescued a small female Rottweiler/Shepherd mix that was a one year old at the time (best guess) that hates cats. She has never had the chance to be around cats since I have owned her and has been a great dog. I have a very large Newfoundland that I have had since he was eight weeks old and he has been a great dog. I rescued an English Mastiff that was well over 100 pounds at six months of age and she is also a great dog. My Mastiff is now 162 lbs at about 21 months of age (still quite a bit smaller than my Newfoundland) and is very well behaved. Because of the history of the Mastiff breed I don't take her to the dog park.My Mastiff has never shown any type of aggression. I walk my dogs and keep them in a fenced yard with a doggy dog that gives them access to the house as well. It is not difficult. My dogs get along well with each other. I would never own a pit bull type or one of the fighting mastiff breeds. If people are allowed to own fighting breeds they need to be muzzled at all times if they are out in public. Fighting breeds should never under any circumstances be in a home with small children. P.S. I have no children. WTF? People will never learn. They will continue to believe the lies and BS about the "misunderstood sweet baby pibbles." Any adult who brings one of those disgusting animals around their children, and something happens to their child, they should be prosecuted. Period. There is no difference between that and leaving a loaded firearm, poison, or narcotics in your child's reach. Matter of fact, if I do leave a loaded firearm or narcotics in my child's reach, I WILL be prosecuted. Why are these dogs that kill at an alarming rate given a pass? It's insane! I have a former friend who is one of those nutters who loves to post pictures of her innocent child and her stupid pit bulls together after a pit bull attack happens. I truly fear for the life of her child, especially seeing as one of those dogs has already shown "testiness" toward children. I can't even wrap my head around what kind of mental illness puts dog lives before the lives of babies and children. Pit bulls and their lunatic pit pushers are one of the leading reasons I carry a concealed firearm – which I had to go through extensive training, education, and background checks to obtain, on top of my LE training, unlike PB owners who can own a deadly weapon without any training. I have had frightening encounters in "dog friendly" businesses (most recently Home Depot) with poorly restrained pit bulls and their ignorant owners. One looked at my 6 year old like a tenderloin. My children are my entire world. Both myself and my husband will kill and die to protect them. It's truly sad that some parents don't feel the same way we do about our little blessings. I pray those that are still willing to be educated will see the light and rid their households of those ticking time bombs. I'm so sorry little Susannah's father wasn't successful in his attempts to get his beautiful daughter away from the dogs that ended her entirely too short life. That poor infant. I noticed that in the FB videos of the dogs, the person speaking (who I think is the teen) will frequently give the pits a command, often "Sit." The pits always obey. I think that's interesting, both because people seem to so often confuse an obedient/trained dog with a safe/friendly dog, and because it's not really normal to constantly be giving obedience commands while you play with your dogs. Sure, sometimes. But the girl is often either directing the pits or, in the case of the three running and wrestling together, shouting to interrupt them. A safe, trusted family dog doesn't need to be ridden like that. You do tend to do it more with multiple dogs, but it's still a lot of commands in very brief videos. Maybe the family didn't consciously know the pits were out of control, but they certainly behaved as if they weren't sure of them. The commands and interuption are given in concerned tones, not as if the speakers were exasperated or simply reminding beloved pets of their manners. To respond to the other comments which jumped from concern about violent breeds to concern about dogs, period, I think you're missing the point here. The circumstances leading to the death of this infant were not due to dog worship, or dog ownership being abnormally sentimental, or to permitting people to own dogs. People have been sentimental and permissive as dog owners for a very long time. What is new is the refusal of people who own breeds which were created for violent behavior to accept or acknowledge their chosen dog's background and potential, let alone doing anything to prevent it. Even as recently as the 1990s, people with Rotties and Presas would simply admit that yes, their beloved pets were substantially more dangerous than Dachshunds and Goldens. As the pit bull owners began to successfully employ aggressive, attack-style denials of the role of genetics in the violent behaviors of dog breeds, the owners and breeders of other violent breeds followed their lead. These people and their dogs are the major problem. I agree, most dog owners can be irritating, entitled and obnoxious. But that's not a sufficient reason to end the human/dog relationship. We just need to be sane about breeds which kill each other and us at an insane rate. Dog-friendly businesses​? When I hear that one, l make it a point to shop elsewhere​. The little female Rottweiler/Shepherd that I rescued was at a no kill shelter full of aggressive pit bulls. You couldn't go near a single cage without the pit bulls biting at the cages and trying to get to anyone that was in the shelter. I have owned the Rottie/Shepherd for over ten years now. She was said to be very cat aggressive so I never gave her the chance to be with cats. She has been great with people and other dogs. She was out of place with all those pit bulls. That top picture really makes my heart hurt. Susannah was so adorable, and her family decided that her life wasn't worth protecting and instead used her to try to make a freaking dog look good. And they failed. They used their own child as a test guinea pig and totally failed. They failed at parenthood. They failed to protect their child. And they especially failed to 'prove' that their pit would never hurt their family members. That's the only good failure that came out of this. K-Hart, you hit the nail right on the head. The mindset these extremist animal lovers have is equivalent to a mental illness. In fact, my husbands step daughter (from previous marriage) was attacked and mauled by a German Shepherd type dog, while doing her job delivering pizza to a house and the owner did nothing to prevent his dog from lunging at her. Now, he ripped her leg up and didn't pay any mind to the fact that she had pizza… so what do you think that beast was really hungry for?? So, in my eyes, he obviously didn't attack her like, "Oh, boy! You have food." Because that may have ended in endless kisses… and not biting down on a leg to not let go. That dumbass girl of ours literally got up, and laughed it off and told the owner it was OKAY!! She didn't want the dog to be put down because it was its "first offense". First of all, how do you know that was the firs time that dog attacked, only because she had to report it because it happened on the clock?? I doubt it, from experience with my own. They bite and they bite again. She loves animals so much she would put another life at risk. I'm sorry, with as much as I liked having them for protection, if you have to put your dog/s away because they're aggressive around company, they shouldnt have a place in our homes. None of my families dogs behaved that way and got away with it. And I come from a hunting family, so we've had our share of dogs and mutts. And yes, if you wondered, my husbands step daughter did adopt a Pitt a couple months ago. One thing I'd like to note about her is that she is an emotional train wreck. She can't keep a boyfriend, she's rude, selfish, talks down to others, but wonders why no one wants to be around her at the end of the day… I feel these types of people are the ones that NEED animal companionship because they don't know how to act like a human being, or know how to deal with their own emotions. Same with this girl I've know for years. Had three dogs, I think. Her and her bf expecting their first child, but on the brink of homelessness, and no one that would allow their pittbulls, and were SO broken up about having to give up their pets, even though they were expecting a child, that they were going to refuse housing over their dogs!!! Emotional instability… that is the pattern I've observed in a lot of these animal loving freaks. Let's just all hope and pray natural selection takes its course, for the sake of the rest of us. Pit bull breeders, dog fighters, and rescue dog dealers (and their media associates) know how to manipulate the minds of naive teenagers to get kids to be youth army propagandists for the lucrative pit bull business. But it is also important to note that THE POLICE DEPARTMENT, all grown adults, fell for the same manipulation and pressure by the pit bull $business$ by repeating their "all dogs bite" propaganda. This is what happens when special interests and commercial industries are allowed to lie to the public and escape scrutiny and regulation, and members of the media do the dirty work for them. A teenager needs adult guidance and supervision, which this girl totally lacked, but adult public safety workers are supposed to work for the public! Oh, wait! Can't believe I forgot to add Ka D, about spay and neuter: but these nut cases will cry that it's cruel and inhumane! The ONLY reason to breed pit bulls is to perpetuate violent, aggressive dogs that have been selectively breed for hundreds of years by man INTENTIONALLY to attack and kill. Of course, that is sociopathic and greedy. So the pit bull industry decided to cover that up with things like the "all dogs bite' myth. They are trying to deny why fighting breeds exist and are bred. Keep a close watch on your animal control department websites and public information. If you find the "all dogs bite' excuse to deny the fighting breed problem, you will know they are working for pit bull industry $$$$$$ interests instead of pubic safety. And that needs to be fixed. and yes, as someone said, a lawsuit or notification by attorneys is often the only thing that will change it. Many people who work in animal control forgot they are public safety officers. Could someone clear up a few questions for me? Did one (or all?) of the dogs that murdered the baby get adopted from Kent County Animal Control? And is it true that the teenage girl (daughter of the mother of the baby) could not afford to pay vet bills and was begging for money using Kent County Animal control's FB page? Also who owned that house? The father of the baby says he lives in Detroit. He does not live at this address. He had asked the mother to get rid of these dogs, that three hundred-pound pit bulls don't belong near babies. But this house doesn't even seem to have enough yard space for one hundred pound dog, never mind three. Who let these people have three large fighting breeds on a property that doesn't even have the room for a normal dog? The neighbors are lucky it wasn't their child that was killed. This was a mauling waiting to happen. I wish that someone had cared enough to get Child Protective services involved earlier. The parent was letting the teenager put herself, the household and the entire neighborhood at risk. Today we had to file "another" FOIA to enable us to answer your questions. It's snail mail only, so we do not expect a response for at least 15 days. 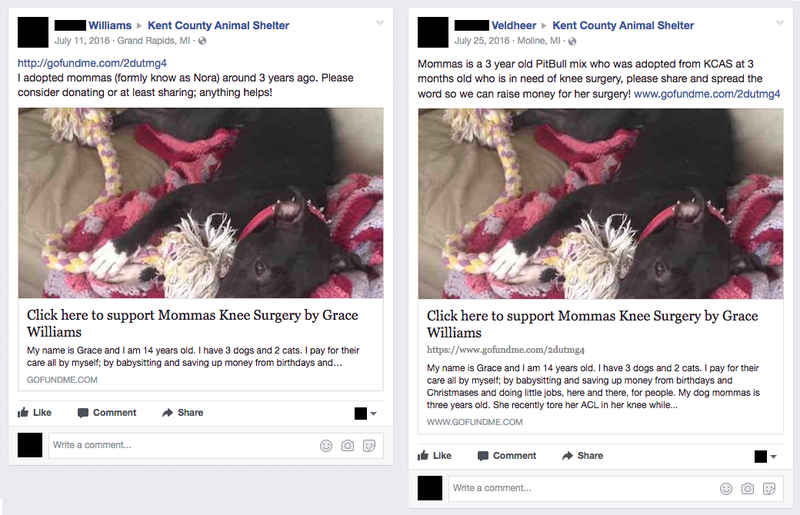 It is CLEAR from "multiple" Facebook posts that Mommas — the black female pit bull — was adopted out by the Kent County Animal Shelter (KCAS) to the Murray family about 4-years ago. So, at least one of the family's pit bulls came from KCAS. It is true teenager raised money to pay surgery fees for Mommas. That is clearly spelled out on the "Mommas Journey" Facebook page. There was also a GoFundMe fundraiser for this purpose (July 2016), but it is now offline. So we do not know how much money was raised. What is ALSO TRUE, during last 12 hours, is that we can no longer link to the Veldheer plea to the Kent County Animal Shelter on July 25, 2016. It has since been removed. Thus, we were forced to replace with a graphic! I would also love to hear others' opinions on this. It does not strike me that ANY of these pit bulls are "mixes." They appear to be the usual pits sold as puppies by pit bull breeders that either end up in shelters after they start to get older and cause trouble, or are purchased directly from the breeders. 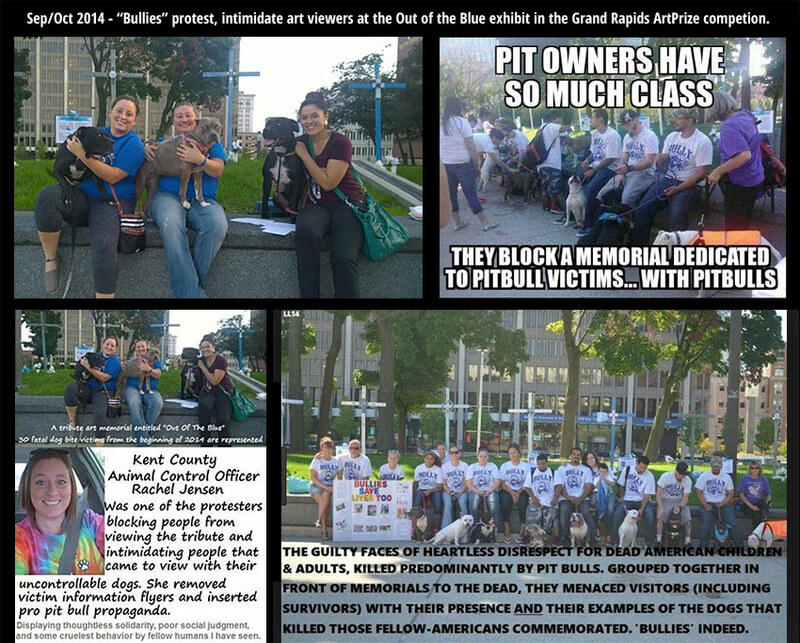 I know that Grand Rapids is infested with pit bull breeders cashing in on the marketing and lack of regulation that the pit bull lobby, the Kent County Animal Control department, and hypocritical humane groups like Best Friends and HSUS are engaging in. Ah, Best Friends. Over the weekend, I saw a young woman wearing a tee shirt with the BF logo and "Save Them All" slogan on the back. On the front? An image of our favorite dog with "Pit Bull Nation" beneath it. And where was this sweet little thing going? To our local humane society thrift store! Where pit bull adoptions are promoted! We may never know which dog(s) had evidence of the attack. That's why all dogs on the property should immediately be confiscated and all of the owners /handlers / dog users banned from any all dog ownership or contact for LIFE. I find it simply amazing and appalling that ANYONE would promote the killers of their tiny infant child! We see where these people's loyalties and love resides…on the dogs. They truly mean it when they say they love their dogs as much as their children. Sick, sick, sick. No one should EVER love an animal to the same extent that they love their children…it's disgusting! Anyway, ANYONE that protects these dogs above human life is a FOOL. People act as if this is a species in need of saving from the endangered list! It's NOT a species! They are a CREATED BREED that should NO LONGER BE BRED! The dogs could care less if another pit bull is ever born again. They are suffering MORE by continuing to breed them you selfish fools! When you breed them you are guaranteeing more will be abused through fighting , neglect, being abandoned etc. others will be put to death after harming someone. And you are also guaranteeing that more people will LOOSE THEIR LIVES AND BE MAULED! Someone please give ONE GOOD reason to continue this man made breed. Is it simply because YOU like the breed & think they are beautiful? Then YOU are a selfish monster that cares nothing about your fellow man NOR THE DOGS! The Canine Good Citizen test is just a worthless piece of paper. It was designed to give a false sense of security and try to fool the public and authorities with fake "authority." Support dogs are just pets. They are NOT service dogs. I wonder if a landlord was not getting concerned about these people filling this house with fighting breeds, and the illusory paperwork was obtained to force the situation. The neighbors had a ticking time bomb among them and were lucky not to be killed. They need to be vigilant because these people were willing to put their own children in jeopardy. They would not hesitate to put their neighbors at risk again. If that pit bull can be an ESA, then I am entitled to a therapy cobra. Did you hear about the so called therapy dog allowed on a plane mauled and destroyed the face of a passenger sitting in seat next to the dog's owner. Gulf War — of course we did. We will be writing about that in a few days. We are waiting for any new possible updates. No charges? Astounded with disbelief. How can this be??? Very sad that no charges will be filed. At the least, child endangerment. Still, the law is what it is, and if the prosecutor feels the law doesn't cover this situation, then I understand that he doesn't want to waste money prosecuting the case. But I agree with this blog, that this means the law needs to change so that it would clearly cover cases like this. Well, it can happen when local officialdom is infiltrated by animal rights extremists. This has happened to animal control agencies all over the country. Police departments have also been affected. I don't consider pit nutters to be animal rights supporters, "extreme" or otherwise. They show this every day when they mock and dismiss the tens of thousands of other pets pit bulls kill annually. True animal rights advocacy is represented by people such as Merritt and Beth Clifton, who recognize that compassion for all species–including the human species–is the true face of the cause. Permit me to add to my previous comment about the efforts of animal rights extremists to infiltrate animal control agencies. Look what just happened in Pima County, Arizona. And note the photo of the dog. Such an adorable *rescued* pibble-wibble, isn't it? On July 3, we updated this post to include the full letter of the prosecutor's opinion. I wonder if the AKC will revoke Rhino's CGC? Or, would that be just too harsh a penalty? I read on a pit bull forum a post about how one pit owner got her Human Aggressive pit bull to pass a CGC after a lot of training for it. That is a dog that wants to bite people, with a certification calling it a "good citizen". Clearly the CGC isn't a temperament test at all, it's just proof of a certain standard of training. Doesn't mean a CGC dog won't attack someone or something in normal everyday life outside of the test conditions. Way too harsh of a penalty. Why, it might even hurt Rhino's feelings! no one is to be prosecuted for an infant's savage death? No one to protect the infant from a demonstrably savage breed of dog? We live in a civilized society? I think NOT. Chihuahua Waves — We LOVE you!!!!! I don't understand this. It sounds like the prosecutor is saying that he can't prosecute, because he doesn't know which dog actually killed the baby. Why would this matter? The same human owned all 3 dogs, and this same human was responsible for supervising all 3 dogs and for supervising the baby (regardless of whether one of the dogs 'belonged' to another minor child in the family, the parent is the one legally responsible.) I don't see how it matters which dog actually did the killing, in terms of prosecuting the owner for neglect/manslaughter/failure to control a dangerous dog/or any other suitable charge. Technically, it does not matter which dog did the killing — not in this particular case — because all of the dogs were contained in the home. Though it would matter in other criminal cases if there were no witnesses in the attack. We have seen the latter scenario, and the lack of matching DNA, kill criminal cases before. What does matter in all criminal cases is proving the dog owner "had knowledge" of the dogs' vicious propensities and acted negligent anyway. This prosecutor could not fulfill what is required to win the case — the mother "knew of acts of previous aggression" and "left the infant alone with the dogs anyway." Without clear evidence of the above, most jurors would acquit too. Juries are often soft on parents that step away for 5 minutes (they did the same thing when raising a child too) and something unforeseen happens. Forgetting all of the nonsense of having to prove prior aggression, this mother had a pack of dogs in her house. That ALONE creates a dangerous situation, especially for an infant. Laws should be written to include these pack scenarios and NO "knowledge" of previous aggression should be necessary! The reason they don't face charges is because the CITY pound that adopts these dogs out are in bed with the CITY police. They give you a pit bull and if it kills your children or your neighbor's children they give you a pass. It makes me sick. This is a family of white trash sociopaths. Kathy — we are sorry about the caption confusion. The baby photo was published by the family AFTER the attack. The baby in the photo is alive and well, when the photo was taken. The family published it AFTER the attack to show how "loving" their family pit bulls were. They published pit bull propaganda in the wake of the baby's death. Outrageous and alarming are two words that come to mind.